Only four of the more than 10,000 horses New Zealand sent overseas during WW1 returned home. 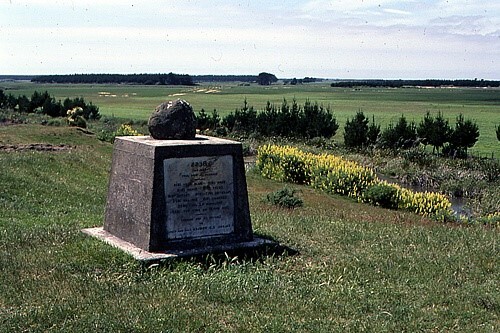 Bess, the best known, is commemorated in a private memorial near Bulls that has become a de facto memorial to all those that served. When news of the outbreak of WW1 arrived in Wellington at 1 p.m. on 5 August 1914, the Government very quickly pledged assistance to Great Britain, including the provision of a Brigade of Mounted Riflemen. Volunteering these mounted riflemen – and their horses – was an obvious choice. Whilst there were approximately 500,000 males, of all ages, living in New Zealand at the outbreak of the War, there were also approximately 400,000 horses in the country. It soon became apparent that horses were to become an integral part of New Zealand’s war effort and there were plenty to choose from. During the Great War, the horse became the animal that became most associated with the War. It is estimated that approximately 16 million of these animals – from both sides – were used during the War, either as cavalry mounts, mounted riflemen or the necessary ‘pulling-power’ to pull guns, ambulances and supply animals. Four mounted rifle regiments were quickly formed in New Zealand with each Regiment comprising 549 men and 608 horses. The existing Waikato Mounted Rifles were subsumed, as one of the four mounted squadrons, into the Auckland Mounted Rifle Regiment. The horses required by the Waikato Mounted Rifles came from two sources. A man could enlist with his own horse and saddlery, and if they didn’t have one, then they were allocated a horse – known as a ‘remount’ – from the stock that the Army had purchased at the start of the War. The horses had to meet some stringent standards. First, they had to be between four and seven years of age. Their height was restricted to be between 14.2 and 15.2 hands. Greys, duns or light chestnut horses were not permitted and geldings were preferred over mares. The average cost of a riding hack was between £15 and £30 and each packhorse and draught horse cost the government up to £40. Nine thousand three hundred and forty seven horses were purchased, at an average price of £17-1-10 for remounts (5,097) and £24-10-0 for artillery horses (4,250). Every horse, like every other item of army equipment had to have a number. A “N↑Z” was branded on one fore-hoof and the horses’ military number was branded on the other. When the New Zealand Expeditionary Force finally set sail from Wellington on 16 October 1914, there were 3,817 horses embarked. By the time they reached their destination in Egypt, 78 had died at sea – or 2% of the entire herd. It soon became apparent that the horses did not take kindly to the rough waters in the southern ocean, as this is where the majority of the deaths occurred. The largest number of horses carried on one ship in the Main Body was 728 on the Troopship “Orari”. There were 85 mounted riflemen men aboard the “Orari” tending these horses. Each horse was exercised for twenty minutes every day on the ramp around the deck and they also received two hours of daily grooming. Shortly after the New Zealand Expeditionary Force arrived in Egypt the infantry battalions were detailed off to serve on the Gallipoli Peninsula. The Mounted Rifle Brigade were not in the initial line-up. However, it didn’t take too long, after the infantry had come ashore at Anzac Cove on 25 April 1915 that the extent of the task in the Dardanelles, and the unexpected high casualty rate, that the Mounted Rifle Brigade were ordered to join the fray. They were ordered to leave their horses behind in Egypt although arrangements were made to take the officers’ horses and a few draught horses to meet logistic requirements. The officers’ horses were never landed but sent back to Egypt. As to be expected, those mounted riflemen who actually survived the ordeal on Gallipoli, couldn’t wait to get back to their mounts that had been cared for by Egyptian grooms during their absence. The New Zealand Mounted Rifle Brigade was now given the task of the defence of Sinai and Palestine. During this difficult task, the average weight that a horse was required to carry could easily reach 130 kilograms. Naturally, this included the weight of the rider. The daylight temperatures were stifling. On 16 May 1916, the Wellington Mounted Rifles recorded a temperature of 52°Centigrade. The provision of water became an urgent necessity for both the men and their horses. Without sufficient water, the horses quickly became battlefield casualties. It was not uncommon for the horses to go without water for 48 hours, and on some occasions they had to endure a wait of up to 60 hours before getting to water. It was not uncommon for the horses to travel for up to ten hours, just to be watered. Flies were another problem! 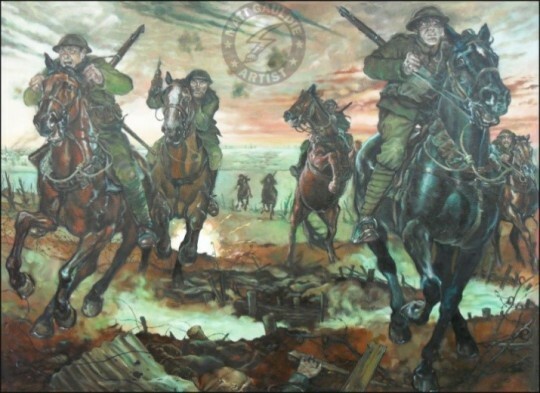 It has been estimated that of the 16 million horses serving the various armies during World War One, over 8 million died. During the War nearly 6,000 horses were sent from New Zealand to serve with the New Zealand Mounted Rifle Brigade. Three hundred and seventy were killed in action out of a casualty rate of 1,402. Of nearly 10,000 horses which left New Zealand for service in both Sinai-Palestine and on the Western Front, only four were known to have returned. They arrived back in New Zealand in July 1920 after spending a year in quarantine. There can be no doubt that the horse became the animal that became most associated with the Great War and formed an integral part of New Zealand’s war effort. A standing there day after day. Where your belly was full up with grass. ‘E on with your saddle and went. You thought you was off to a picnic. O’ the millions o’ sheep that ‘e’d shorn. An’ its feed up and water by calls. An’ you can do nuthin’ but grin. And march you poor beggar to war. We’re mates in one grave at the end.